Myrtle Bates Williams, 99, died on July 5 in Boulder, CO, her home for the last 26 years. Born on June 15, 1919 in Darien, she was the daughter of Walter and Jessie (Pierce) Bates. Myrtle Williams Bates, 99, died July 5. Her funeral will be at a later date. Myrtle lived in Lancaster, PA, La Mesa, CA, East Longmeadow, MA, Lexington, MA, Longmont, CO, and St. Paul, MN. She worked at various clerical positions. Her last two jobs were perhaps her most fulfilling, one at Historic Boulder and another at the Boulder Public Library. She retired at age 81. Myrtle loved gardening, reading and classic movies. She was an excellent cook, known for her stuffed tomatoes, exceptionally flaky piecrust, and many desserts featuring whipped cream and dark chocolate shavings. From childhood she was a faithful and frequent correspondent with a number of family members, including especially her two daughters, two sisters, a brother and her mother, as well as friends. Most of them will recall the clippings she loved to save and send to them. She enjoyed a healthy diet, something her children came to appreciate only after they left home! This was doubtless a factor in her being a 50-year cancer survivor, as well as her longevity. Myrtle had a lifelong love of music, nature and American History, especially the story of her ancestors’ Mayflower voyage to the New World. Myrtle was married to Arnold Williams until 1961, after which she raised three children on her own. She is survived by her children: Barbara Bennett and husband, Michael Chapman, of Boulder; Jean Williams of Wakefield, RI; and Evan Williams of Angeles City, Philippines; two of her six siblings: her sister, Alice Stevens, of Loudonville, NY; and brother, Frank Bates, of Darien; and many nieces and nephews. She was predeceased by brothers Elwood Bates and Walter Bates, and sisters Beatrice Sullivan and Florence Wyland. She is survived by one grandchild, Ben Bennett of Deerfield, MA; and 3 great-grandchildren: Claire, Gage and Madeline. Myrtle served proudly as a member of the Women’s Army Corps in World War II. 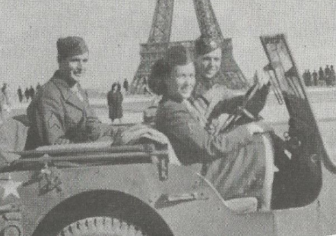 As an aide to the head of the engineering corps, she was stationed on the front in both Paris, France and Frankfurt, Germany. Myrtle spent her last years lovingly cared for at ManorCare where she was a beloved resident. She left draped in the American flag that she loved and respected throughout her life. In lieu of flowers, donations may be made to either Historic Boulder, 1200 Pearl St. #70, Boulder, CO 80302, or the Boulder Public Library, 1001 Arapahoe Ave., Boulder, CO 80302. There will be a memorial service in New England at a later date.